Pat Buchanan Asks "Is Trump Assembling A War Cabinet?" Gen. James Mattis, the secretary of defense, appears to be the last man in the Situation Room who believes the Iran nuclear deal may be worth preserving and that war with Iran is a dreadful idea. Yet, other than Mattis, President Donald Trump seems to be creating a war cabinet. Trump himself has pledged to walk away from the Iran nuclear deal — “the worst deal ever” — and reimpose sanctions in May. U.N. Ambassador Nikki Haley echoes them all. Yet Iran appears not to want a war. U.N. inspectors routinely confirm that Iran is strictly abiding by the terms of the nuclear deal. While U.S. warships in the Persian Gulf often encountered Iranian “fast attack” boats and drones between January 2016 and August 2017, that has stopped. Vessels of both nations have operated virtually without incident. What would be the result of Trump’s trashing of the nuclear deal? First would be the isolation of the United States. China and Russia would not abrogate the deal but would welcome Iran into their camp. England, France and Germany would have to choose between the deal and the U.S. And if Airbus were obligated to spurn Iran’s orders for hundreds of new planes, how would that sit with the Europeans? How would North Korea react if the U.S. trashed a deal where Iran, after accepting severe restrictions on its nuclear program and allowing intrusive inspections, were cheated of the benefits the Americans promised? Why would Pyongyang, having seen us attack Iraq, which had no WMD, and Libya, which had given up its WMD to mollify us, ever consider given up its nuclear weapons — especially after seeing the leaders of both nations executed? And, should the five other signatories to the Iran deal continue with it despite us, and Iran agree to abide by its terms, what do we do then? Find a casus belli to go to war? Why? How does Iran threaten us? A war, which would involve U.S. warships against swarms of Iranian torpedo boats could shut down the Persian Gulf to oil traffic and produce a crisis in the global economy. Anti-American Shiite jihadists in Beirut, Baghdad and Bahrain could attack U.S. civilian and military personnel. As the Army and Marine Corps do not have the troops to invade and occupy Iran, would we have to reinstate the draft? And if we decided to blockade and bomb Iran, we would have to take out all its anti-ship missiles, submarines, navy, air force, ballistic missiles and air defense system. And would not a pre-emptive strike on Iran unite its people in hatred of us, just as Japan’s pre-emptive strike on Pearl Harbor united us in a determination to annihilate her empire? What would the Dow Jones average look like after an attack on Iran? 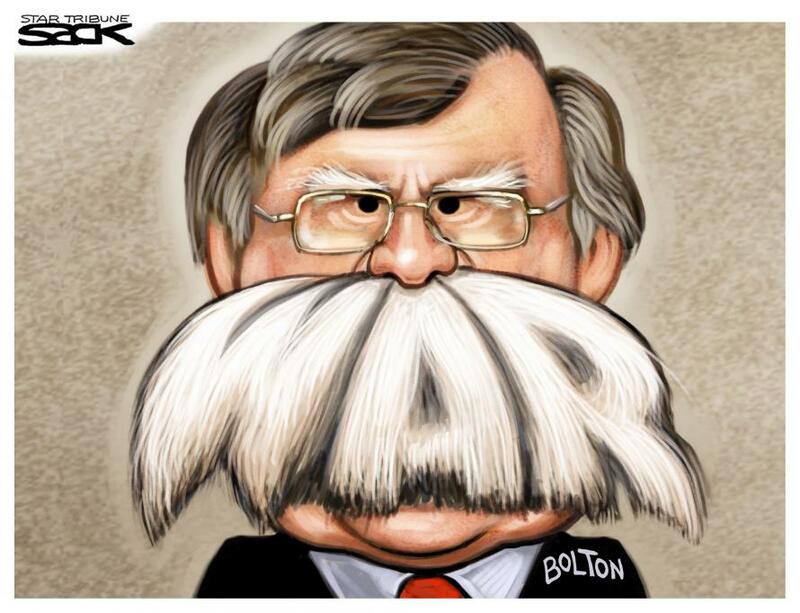 Trump was nominated because he promised to keep us out of stupid wars like those into which folks like John Bolton and the Bush Republicans plunged us. After 17 years, we are still mired in Afghanistan, trying to keep the Taliban we overthrew in 2001 from returning to Kabul. Following our 2003 invasion, Iraq, once a bulwark against Iran, became a Shiite ally of Iran. The rebels we supported in Syria have been routed. And Bashar Assad — thanks to backing from Russia, Iran, Hezbollah and Shiite militias from the Middle East and Central Asia — has secured his throne. The Kurds who trusted us have been hammered by our NATO ally Turkey in Syria, and by the Iraqi Army we trained in Iraq. What is Trump, who assured us there would be no more stupid wars, thinking? Truman and LBJ got us into wars they could not end, and both lost their presidencies. Eisenhower and Nixon ended those wars and were rewarded with landslides. After his smashing victory in Desert Storm, Bush I was denied a second term. After invading Iraq, Bush II lost both houses of Congress in 2006, and his party lost the presidency in 2008 to the antiwar Barack Obama. Once Trump seemed to understand this history.